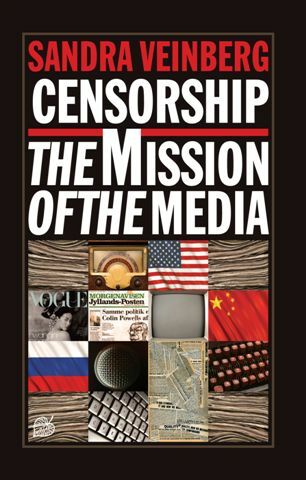 Censorship – the Mission of the Media examines the role of the media in censoring social life events and everyday processes in a popular science way. “Silence is golden; speech is silver” – this clever saying is widely used, and as a policy it helps one to integrate into society. Correct and incorrect exercising of free speech is also characterised by a conclusion made by Ernest Hemingway in that it takes at least two years for a man to learn to speak and at least 50 – to understand what he must not speak about. In her book, Sandra Veinberg discusses this topic is in a more detail. The author considers not only traditional manifestations of censorship but also “self-censorship” and its sources. Under the conditions of globalisation, where the world has shrunken and the Internet enables unlimited non-conversational communication, where Ryanair and its cheap flights turn faraway exotic countries into the ‘suburbs’ of our home country, self-censorship becomes a significant form of communication. What is allowed in one country is forbidden in another. The Danes published their Muhammad cartoons in the Danish newspapers; though protests arose in other countries — thousands of kilometres away from Copenhagen. The phenomenon of trans-border censorship is gradually expanding. The book focuses on different types of trans-border censorship in trying to find out why society still needs “fabrication of enforced acceptance” (Noam Chomsky). In essence, today’s Western democracies are no freer than traditional totalitarian societies. “Orwellian Big Brother spying on us from above, there are many smaller brothers who won’t leave us in peace.” (Merit Mazzarella). Vertical censorship is a well-known phenomenon in Syria, Russia, and China. Today’s novelty is censorship globalisation. It does not fit merely within one system of a country’s censorship or public prejudices anymore. It means that the hitherto ”engineering of consent”, common to all societies, does not function anymore, since the media function across national borders via the Internet, and what is volonté generale in one country, may not be so in another. The media work as censors not only in the interests of the existing power, economic elite or their owners. They help to maintain prejudices, the most typical among manifest themselves as xenophobia. This book examines xenophobia in Western-European countries, taking the media of politically neutral Sweden as an example as well asfocusing on some significant campaigns in the media of other Western-European countries where xenophobia is apparent (the Vogue advertisement campaigns, war journalism, misery memoirs, Günter Wallraf, Fabbrizio Gatti, the Swedish Building Workers’ Union Byggnads PR campaign against guest workers, better known as the Vaxholm conflict. Swedish media and opinion-forming culture elite groups. At that time, the Swedish press regarded ABBA as tawdry and even dangerous to the Swedish musical life. It is no secret that the pressure of the media and society largely contributed to the group’s split-up. Vertical censorship in the media had one frame of mind maintaining that such a style mismatches the ruling left-oriented morality and stage paraphernalia. Horizontal censorship cast the last stone and wiped the phenomenon off the stage and out of the recording studios, although today the fame and success of the super-group are running even higher that it could have been forecasted 30 years ago when ABBA held its final concert. The question as to who owns the truth in modern society is still open. Because censorship does not only refer to the assassination of Anna Politkovskaya, as well as of dissidents in dictatorships, the suppression of artists daring to create art breaking the taboo norms of the culture nomenclature (such as Solzenicin, Shostakovich, Chiwoniso Maraire, Anvar Gul, modern ballet troupes in Somalia or Iran, performances of students from the Royal Institute of Art in Stockholm held in St. Görans hospital and in the Swedish underground system in 2009, etc.). Censorship also emerges in official public opinion studies – in the way of concealing particular news and the deliberate eradication of journalists from broadcasting, the increasing willingness of national security services to control our mail, income, luggage and clothing in the airports. Censorship is present almost everywhere, and hopefully we will learn to notice it. Let alone because freedom of truth is a value worth fighting for, especially at a time when the financial crisis is ruining the world and when freedom of speech, as a topic, is no longer central to the field of discourse in many places. This book tells about this, too.